The federal government of Mexico has not legally specified an official language, however Spanish, which is spoken by 97% of the population of the country, is the de facto official language. Additionally, all indigenous languages have legal protection, and indigenous peoples are entitled that some government services and documents are provided in their language. Develop your command of the language. From the simple to the complex, gain the confidence to share your ideas and opinions in your new language. Develop the conversational skills to plan adventures, care for your health and move abroad. Talk about government, work, movies, family, and more. Includes everything you need to learn at home and on the go. What Will I Learn This level will help you: Build your vocabulary and language abilities Read, write, speak and understand your new language Speak without a script Retain what you've learned Practice unscripted conversations in your new language Negotiate complex situations with confidence and accuracy Sample topics include: The basics, such as age and family relations Questions, greetings, introductions Telling time, calendar terms, the weather Directions, locations, dining out Emotions, opinions, ideas Political, media, business terms Arranging home repairs Planning to move abroad Discussing the arts and tourism Careers and conducting interviews Problem-solving and commercial transactions What Do I Get? Interactive Software Our award-wining version, complete with proprietary speech recognition technology. Audio Companion For your CD or MP3 player so you can review while on the go. Headset with Microphone For use with our state-of- the-art speech-recognition software. Live Online Lessons Practice sessions led by native speaking tutors. Games & Community Language- enhancing games move you towards real-world proficiency. Mobile Companion Learning application for your iPhone or iPod Touch device. 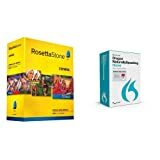 The Rosetta Stone language learning software for Spanish (Latin America) Levels 1 and 2. Comes with the User Guide, Instructions, Audio Companion (practice what you've learned for Levels 1 and 2), and CD-ROM software for Levels 1 and 2. Missing the Headset with microphone.